This is true. This is a thing that happens. Not to me of course. I then return to my impenetrable mountain fortress and have myself some bread and grilled pork. This entry was posted on Monday, February 7th, 2011 at 12:00 am and is filed under Comics. You can follow any responses to this entry through the RSS 2.0 feed. Both comments and pings are currently closed. Not sure if you’re a Deadmau5 (techno artist) fan, Ence, but if you’re a Facebook user, like his page and check out his Minecraft adventures. Pretty entertaining pictures, though I’ve yet to try the game myself. got some skills there, cutting the diamond perfectly with a pickaxe. do you play on multiplayer? If there’s enough interest, we’re going to set up a Massive Pwnage server. Should be fun! I’m running a Bukkit server (with several plugins) on an 8 year old HP. It’s no supercomputer, but it runs smoothly. I wouldn’t be surprised if somebody’s already done something like that. There’s so many possibilities with what you can do in that game, especially with redstone circuits. Oh god, why does this always have to happen! There’s always that one block of lava right under/over/near where you’re digging that destroys whatever you just mined. Since I have taken precautions. Should I ever mine down into a resource (the only way I will, now) I will drop a square of water next to it. The water flow gets inconvenient for me, but it will fill the hole and douse the lava before whatever it is gets destroyed. I hate lava. Love obsidian, but hate lava. I have a ton of obsidian. I made a gate, but now I don’t know what to do with the rest. 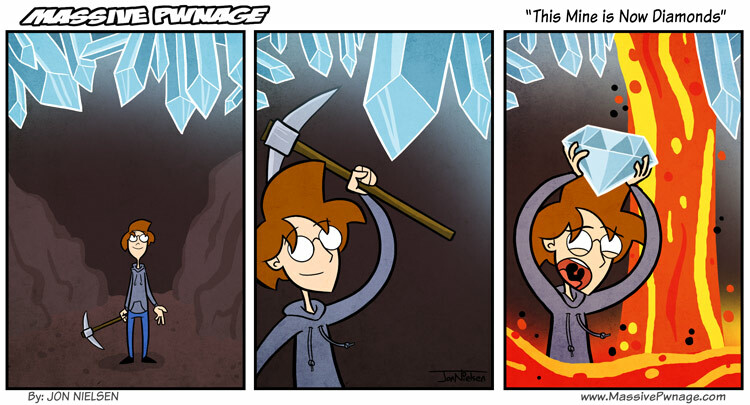 So, this comic basically means you still haven’t found a diamond mine in minecraft? Would be nice if you bought a minecraft server..